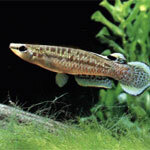 You can find this active fish mostly in the upper water layers. Males rival to each other for the favour of the females. The aquarium should be set up with fine leaved plants on the sides and background like javamoss, some floating plants and a dark gravel substrate. In the middle you should leave enough free swimming space. You should feed them with all kind of live food. Breeding is easy. The temperature should be a little bit higher ( 23 - 28º C, 73 - 82ºF). The eggs are laid and fertilized between fine leaved plants. The eggs hatch during a period of 1 - 14 days. The young can be fed without problems on powdered dry foods and Artemia nauplii. Ideal for the community tank as long as kept with fish of an equal size of bigger. May nip at fish with long flowing fins.